I share this photo not so much for the shot itself, but the story behind it and also to prove a point. 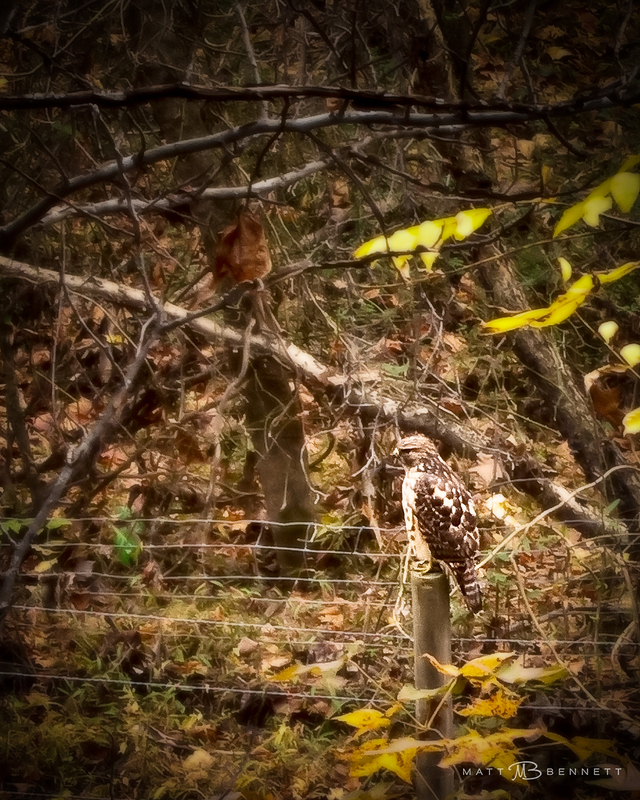 This hawk was perched on a fence post behind my office one afternoon. I spotted it from the 2nd floor landing, and ran like crazy to grab the only camera I had with me that day. Amazingly it was still there when I returned. What’s even more remarkable was, I quietly walked up the side walk parallel to where the bird was, and it sat there just long enough for me to get this shot. I was only about 30 yards away! Any camera is better than no camera at all, but I was kicking myself for not having my DSLR and at least a lens with a 200 mm reach! This was just one of those rare moments that you usually don’t find yourself in. Despite being at close range, my point and shoot camera didn’t have enough reach to get a well deserved close up. I got the shot, but what I would have given to have had my DSLR and 300 mm lens! Zoomed in tight with a shallow depth of field to blur the busy/cluttered background, and this could have been a great photograph. Nikon Coolpix P6000. All images © Matt Bennett Photography. This entry was posted in Raptors, Wildlife by Matt Bennett. Bookmark the permalink.